Who’s behind My Wedding Wish? My Wedding Wish is the dream-child of Marriage Celebrant Lynette Maguire who lives on the Sunshine Coast, Queensland. Lynette is a passionate philanthropist and is well known for her bubbly personality and upbeat weddings. Under the outgoing exterior lies a person who was so touched by the “wedding that started it all” (read below), that she decided something needed to be done to help the terminally ill be married with dignity and grace. Lynette is supported by an amazing group of people who form the Steering Committee, and of course, our awesome wedding suppliers around Australia – without them, there would be no My Wedding Wish. Lynette is happily married to husband Ken, and their daughter Bronte has flown the coop and now lives in Melbourne. 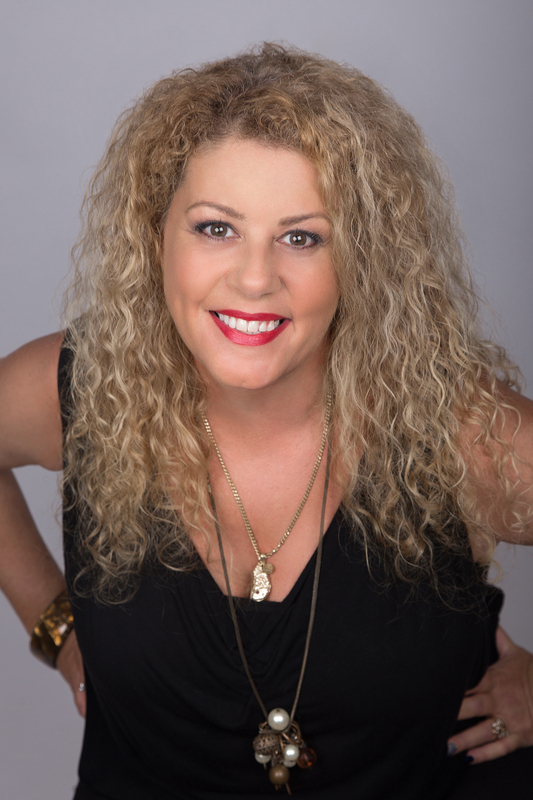 Lynette has just completed her Doctoral degree and she also teaches at University of the Sunshine Coast and runs several wedding related businesses. I have always believed that there are no coincidences or accidents in this world – that things happen for a reason. 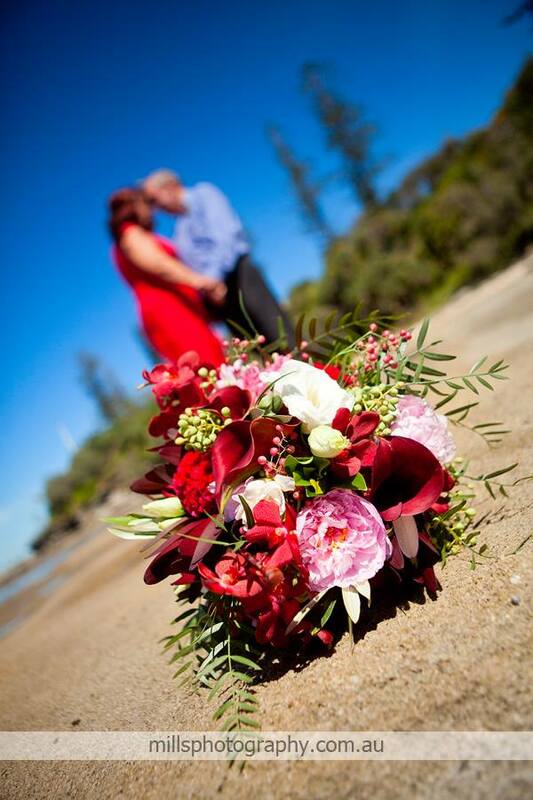 I’m a registered Civil Marriage Celebrant and have been for ten years, but most of that ten years has been focused on completing my tertiary degrees at the University of the Sunshine Coast. I’d like to share with you a story that changed my life, and hopefully will change the lives of many Australians. “Of course, I’m happy to help”, I replied. “I can meet you on Thursday”, my mind wrapped around a Cognitive Psychology assignment. “I don’t think he’ll live until Thursday.” “What’s your address, I’ll be there in an hour”, the assessment fading. It was 11.00am. The house was a rented property and was dark and silent. In the middle of the living room was a palliative care bed where the young man lay. He was 24 years old. His fiancé lay next to him stroking his face, whispering “I love you’s” and crying softly. I met the family and spoke to the couple who both signed the legally required Notice of Intended Marriage and I checked their paperwork was in order. That was the easy part! There was just one small hitch! One month’s notice is required for a legal marriage in Australia, and this young man would not survive the week, let alone a whole month. My only option was to request a ‘Shortening of time’ from the Magistrates Court to allow the couple to marry immediately. At 1.00pm I rang the Maroochydore Courthouse and arranged for the groom’s mother and the bride to meet with a Magistrate at 3.00pm. In the meantime, I rang some friends in the industry and asked if they would donate their time and services for the couple’s wedding ceremony. Within 30 minutes, I had a photographer and a florist on board, and at 3.30pm the Magistrate granted the shortening of time. The wedding was on. 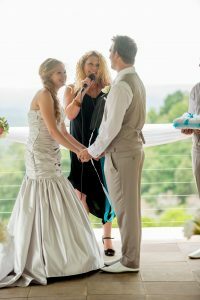 Founder of My Wedding Wish and Marriage Celebrant, Lynette Maguire, marrying Chrissy and Nathan at Maleny Manor in 2013. Our first official gifted wedding. I married the couple at 5.00pm that afternoon in front of a handful of close family and friends. It was important to the groom that he walk to his wedding ceremony, and it was clear that those 15 steps were difficult and painful. He was slow, deliberate and determined. The couple kissed, and he sank gratefully into an overstuffed armchair. She sat on the chair’s arm and they held hands. The ceremony was short and I must say it was the most moving ceremony I have ever performed. While there was understandably so much sadness, there was without a doubt more raw love than I have ever experienced at any ceremony before, or since. Tears flowed, the couple kissed and held each other – his dying wish was granted. The beautiful young man passed away as a married man two days later. I cried when the family rang me, and my heart ached for his devastated young wife. Which gets me back to my original statement: things happen for a reason. This couple and their beautiful ceremony resonated with me. It rolled around in my head for years until finally at the end of my Doctoral Degree, when I found I had more time, I decided to do something with the memory. Surely he wasn’t the only person who was battling a terminal illness and wanted to marry his love? There’s a Sunshine Coast wedding suppliers’ Facebook page and I jumped on and posted a “this is my idea – is anyone interested?” post. I was, and am, inundated with offers from wedding suppliers to be involved. Our first official My Wedding Wish gifted wedding was Chrissy and Nathan’s wedding on 11.12.2013. And My Wedding Wish was founded.